Students will draw their grass plants as they observe growth over time. There is also a place to make comments about what they see! The book is intended to be copied double-sided, folded in half, and stapled at the spine. 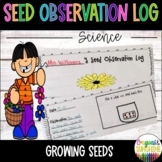 I created this observation log to use with my 1st graders for the school science fair. We planted 4 seeds (one without soil, one without water, one without sun, and one control plant) to see what would happen over the course of a few weeks. Our plants and experiment were a hit at the science fair! This is a plant observation book to be used if students individually plant seeds in your classroom or they can use it to observe plants outside. Page 1: students label parts of a plant Page 2: Students write materials that they need or used to plant their plants Page 3: Students write a "how to"
Plant Observation Packet: Ready, Set, Grow! Observing is a critical skill in science. Taking nature walks to observe and log a students surroundings is important. With this log students will answer questions and record the plants, animals, weather, and sounds around them. *Has places for sketches too for different types of learners.